Released on September 5th 1980, "Baggy Trousers" was the first track to be released as a single from the second Madness album Absolutely. The lyrics reminisce about life at a comprehensive school, and focus particularly on the lack of discipline, and the kids (and teachers) breaking or bending the rules. They were in complete contrast to the dark lyrics in Pink Floyd's "Another Brick in the Wall (Part 2)", which describe oppression at a public school. Indeed, according to Suggs himself, it was more often than not the kids giving the teachers a hard time at his own school, and he set out to redress the balance with a more fun approach, as in the line "having fun and playing fools". 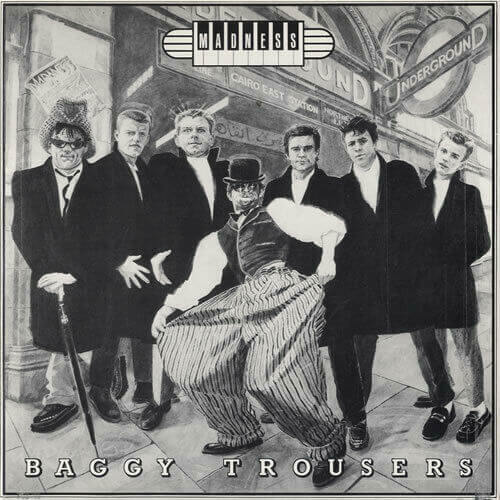 "Baggy Trousers" was penned by the band's frontman Graham McPherson (Suggs) and their guitarist Chris Foreman. The B-side was "The Business", which was written by their keyboard player Mike Barson. The video was filmed at Islip Street School and a nearby park in Kentish Town, London. The most memorable and iconic moment features the band's saxophonist, Lee Thompson, flying through the air - this effect was created using wires suspended from a crane. We also see the band playing in the school hall and outside the school. Plus, the schoolkids themselves can be seen in various scenes that relate to the lyrics including "Playing football in the park, kicking pushbikes after dark". The video came at a time when music videos were very much in their infancy, and not all artists were releasing them in 1980. Released on the Stiff Records label on 7" vinyl only, the single entered the UK charts at No.36 on 7th September 1980, making it the second highest new entry - Stevie Wonder had the highest new entry with "Masterblaster (Jammin')" at No.30. Madness reached No.3 on 5th October, with Ottawan's "D.I.S.C.O." at No.2, and "Don't Stand So Close To Me" by The Police at No.1. These chart positions remained for two weeks.